Blaster's Universe is a short-lived Saturday morning animated series produced by Nelvana and aired from October 2, 1999 to September 9, 2000 on CBS in the USA and Teletoon in Canada. It was based on the Blaster Learning System CD-ROM series, as it was reimagined in the late 1990s. The show is in continuity with other games of the era, such as Math Blaster ages 5-7. Set in the year 2222, it chronicles the adventures of Max Blaster, a bright, impetuous 12 year old boy obsessed with science and space, and his best friend G.C., a cool 12 year old girl who looks like an earthling but is really an alien. Also joining them is a brave and loyal Robot Dog named MEL (acronym for Mechanically Enhanced Lapdog). Together, they travel across the galaxy to stop intergalactic villains from destroying their home planet of Omega. It only ran for one season, and aired in reruns on the network KidsCo in international countries like the UK and Australia until the network was canned. Adorkable: Max Blaster is laid-back and energetic, but is still cute at the same time. An Aesop: Often learned by Blaster or G.C. Animated Adaptation: It's an adaptation of an edutainment CD-ROM series. Badbutt: The main characters, Blaster and GC being kids and MEL being a Team Pet, and each episode has them fight evil. Big "NO! ": Major History does it at the end of "You're History" when Blaster defeats him by zapping him with the Bomb-Turned Muggle and making him disappear. Book Dumb: Blaster, only sometimes. Other times, he's a Badass Bookworm (or reforms into a Badass Bookworm, for that matter). Bratty Half-Pint: Zak in "Math Schmath" is a spiteful student who plays pranks on Blaster and GC and dislikes math. He tags along with them on their mission however. Calling Your Attacks: Parodied in one episode, when Blaster, while trapped in a cage, attempts this by holding up MEL pretending him to be a weapon and yelling "FIRE NOSE-CONE!" before popping the dog's nose open. Cassandra Truth: Defied in "Uncool Copycat", when G.C. doesn't believe Blaster when he tries to tell her that he saw two moons around Earth, but then finds out he's right when they discover that an evil artist named Deja Vu is making life-sized copies of everything. Catch-Phrase: Blaster's "What a blast!" Cloning Blues: The plot point of "Uncool Copycat", in which the scheming beatnik artist, Deja Vu, makes copies of everything (which he claims is art at first) and everyone. Continuity Overlap: With the 1999 version of the games. Daydream Surprise: Sometimes done by Blaster, for example in "You're History" as a daydream where he and his friends make an escape in their ship from Illitera, and later in "Gym Nausium" as virtual reality where Blaster and GC are challenged by two anthropomorphic deer (who turn out to be MEL and Blaster's dad in real life) in a snowboarding race. Deadpan Snarker: GC can be bitter and sarcastic towards Blaster sometimes. Max: Yeah! What a blast! Pirate: What? Head's up, what?! MEL: What? (looks up) Head's up? Embarrassing Slide: In "Misplaced Weekend", MEL is showing a montage of all the nefarious things Dr. Dabble has done. The last thing he shows is a scantily-clad poodle on the beach. He blushes and asks "How did that get in there?" God Guise: Happens to Blaster, G.C. and MEL while they're in the planet Moocowzia in "Hero Today, Gone Tomorrow". Keet: Blaster is a cheerful, hyperactive boy. Last-Name Basis: Blaster, but the only characters who know him as "Max" are his parents. Mind over Manners: The plot point of you-know-which-episode-whose-title-is-actually-this-trope's-name.note "Mind Over Manners"! Mocking Sing-Song: In "You're History", the Major sings "Nya nya, told you I know everything!" at one point. Plucky Comic Relief: Max Blaster, despite being the main character. Also, MEL. Pre-Mortem One-Liner: "Well, you asked for it. You're history, Major History!" Punny Name: Max Blaster is obviously a pun on Math Blaster. Robot Dog: Mel, obviously. He still has instances of furry reminders, though. GC: So, what do you want to do today, Blaster? Blaster: Oh, the same thing we do every day, GC: stop some super-villain's plan to take over the universe! Short Runner: It only lasted from 1999-2000 with one season and 13 episodes. 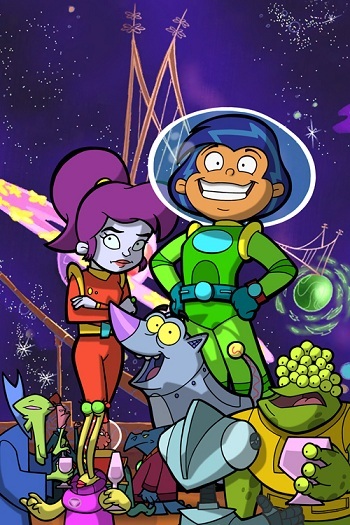 Spiritual Successor: Let's see...sometime after the show was canceled, Nelvana made another educational science fiction series in which some kids and a robotic animal sidekick go on several adventures to stop a villain from taking over the world. And it even shares the same animation style and logo design. They Fight Crime! : An energetic human boy, a no-nonsense alien girl, and a robot dog. They fight crime, but with math, phonics and other education. Title Theme Tune: "Blaster's U-u-u-universe! B-b-BLASTER'S U-U-U-UNIVERSE!" Uncanny Family Resemblance: Max's parents look like him. Word Schmord: Episode 10 is "Math Schmath". You Gotta Have Blue Hair: Max has blue hair and GC has purple hair, just like they did in the Blaster games of the time.